Over a year ago the Kodak camera brand was re-born under the auspice of new licence holder JK Imaging. After its initial releases of inexpensive point-and-shoot and bridge cameras sold through Argos and Tesco, comes its most serious proposition: an interchangeable lens compact system camera in the form of the Kodak Pixpro S-1. The 16 megapixel Kodak S-1 is not only a first for its new licence holder; it is also a first for the Kodak name in terms of camera format. We can tell JK Imaging/Kodak is stepping up a gear. There's the fact that our review sample came in the form of a comprehensive starter kit that included S-1 camera body, two compatible zooms, plus a clip-on P10 accessory flashgun. If you go for the twin lens kit, the included lenses are the SZ ED 12-45mm f/3.5-6.3 AF, plus SZ ED 42.5-160mm f/3.9-5.9 AF. So we're basically covering all framing opportunities between ultra wide angle and extreme telephoto out of the box. For those who want to go further, there is further opportunity: we were also sent a whopping SF 400mm f/6.7 fieldscope lens, ideal for the 'twitchers' or amateur paparazzi among us, but at the time of writing a price/release for this hadn't been confirmed. But back to the camera for the moment: the most important thing aside from the quality of the lens when it comes to any interchangeable lens camera is the size of the sensor. Here, by way of another first, JK Imaging/Kodak has opted to sign up to the Micro Four Thirds format jointly developed and employed by both Panasonic and Olympus since 2008/09. 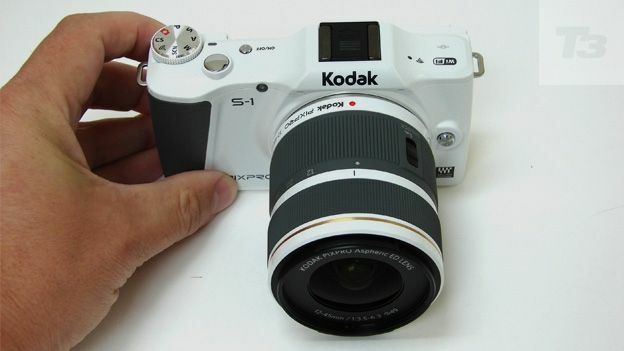 So, while the S-1's imaging sensor is bigger than the one-inch chip incorporated by Nikon's rival '1' system - and the 1/2.3-inch sensor used by most point-and-shoot digital cameras - it is still smaller than those APS-C sensors found in rivals like the Sony Alpha 6000, Samsung NX300, Canon EOS M and Fujifilm X-T1. In fairness Kodak would argue that the 'compromise' of a smaller sensor equalling smaller lenses and smaller bodies is one that is worth it, as with Olympus and Panasonic before it. And those who prefer a smaller bodied camera that will still give their photography a visual step up from a smartphone or snapshot camera, may well agree. Pitched at the avid photographer, the metal-bodied Kodak S-1 at least looks the part, resembling a miniature SLR. There is a choice of stylish 'arctic white' finish complete with black detailing on the handgrip, controls and lens barrel - being the version we had in to look at - or a more sober all-black version. We don't get an eye-level viewfinder incorporated on the S-1, but at least a tilting LCD screen is provided in order to achieve some inventive framing choices. Body integral Wi-Fi is the mechanism by which shots are shared, while Eye-Fi card compatibility is further offered. Unlike Panasonic cameras (but like those from Olympus), the Kodak offers sensor stabilisation too, meaning that any attached lens is automatically stabilised, so we don't have to seek out specially stabilised optics. Slim, highly portable and originally developed for the Asian market, where the general feeling is the smaller the camera the better, at its UK announcement at the start of this year, JK Imaging admitted it had yet to find a potential stockist for the S-1. It transpires the brand will now be selling direct form its own site this September at very reasonable sounding £349 with a single lens, or £449-£499 for the twin lens pack we had to play with. This pricing seems to make sense, as the product would have to offer great value to be able to compete with the far more established players in the market who, in some cases have a 5-6 year head start on Kodak for compact system cameras. But at least by adopting the same camera system as Panasonic and Olympus, it could be argued that this brand is hitting the ground running. So how does Kodak's first-ever interchangeable lens compact fare? In its white iteration the S-1 looks relatively minimalist. Its control layout is similarly unthreatening. In fact it resembles most other entry-level system cameras, with features immediately that recall what owners might have previously found on a point and shoot. Thus we get bottle top-style shooting mode wheel on the top plate, which is arguably one of the most important features. This offers the user a concise eight options, including the creative quartet of program, aperture priority, shutter priority and manual control, plus the choice of fully automatic, including pre-optimised scene modes. On the same dial we also find a dedicated Wi-Fi mode, and one for custom settings to which the owner's preferred personal settings can be attributed. A small on/off button and a raised shutter release button complete the relatively sparse top plate controls. Unusually for an entry model there's no built-in pop up flash, but rather a hotshoe for the attachment of accessory flash, provided in our kit; only you've obviously got to remember to take it with you for any eventuality when heading out, as was the case with lower-end Samsung NX cameras. Since its backplate controls resemble those found on any compact, the S-1 is very much a camera that anyone can pick up and start using straight away, though we felt the text for the on-screen menu options could have been a tad larger. At the rear we get a dedicated video record button set into a thumb pad top right, and in the middle of the plate, to the right of the tilting LCD screen, is a four-way control pad/ scroll wheel for tabbing or spinning through said camera settings. Playback, menu and two Function buttons, which also act as zoom or delete buttons when the camera is in playback mode, complete the set up. It should be noted that the zoom lenses provided out of the box are retractable in order to maintain as compact a complete set up as possible. So, just as on early Olympus compact system cameras, the lens here has to be fully extended by hand before the camera will function. Otherwise we simply get an on screen prompt. This adds a second or two to the time it takes from pressing the on/off button to actually being able to use the camera - unless, obviously, you've remembered to extend the lens beforehand. The means of composing and reviewing our images in-camera is here handily articulated. The 3-inch LCD, which boasts a resolution of 920,000 dots in the absence of any optical or eye-level viewfinder, can be tilted upwards through 90 degrees or downwards by 45 degrees. This is handy for low-to-the-ground or high-angle shooting. We found its visibility to be clean and clear, both inside and outdoors. This is not, however, a touch screen, which might have been a nice extra, nor can it be flipped upright to face front for that inevitable selfie. Still, this is a first-generation model, so we wouldn't expect to be given everything in our first helping. As it is, a tilting screen is better than a fixed one for extending the creative possibilities for both video and stills composition and review - and for that we are grateful. The S-1 comes supplied with the standard rechargeable lithium-ion battery, here a LB-070, which offers around 410 shots from a full charge. This is a better than average performance, when most competing CSCs at this end of the market are lucky to manage 300 images before their juice is fully depleted. Despite being an entry model the S-1 still offers a grown up choice of Raw and JPEG shooting, accessible in program mode. Image files are committed straight to optional yet essential removable SD card, for which a slot is provided next to the battery compartment at the base. Squeeze the shutter release button halfway and the image on screen visibly adjusts. Press down fully to take the shot and a full resolution 16-megapixel image is committed to memory in around three seconds; pretty standard for this class of camera in truth. In terms of video, recording is a nigh-on-instant one-touch process, filming instigated via a thumbnail press of the red button top right on the camera back. At this point the on-screen image ratio narrows to 16:9 format, and black bands crop top and bottom of frame, cinema style. Obviously any zooming when shooting video is a manual process, just as it is when capturing stills - which means we don't have any mechanised buzz to contend with on the (stereo) audio track, but you'll want to practice your adjustments to keep them smooth and steady. Happily focus is an automatic process, the camera gradually adjusting once you have zoomed in fully, which means we had a few seconds of softness before the frame gradually drifts back into focus. Still images are as sharp and colourful as you'd expect from a camera bearing the Kodak brand, with the added ability to apply effects filters if you want, including the usual toy camera - corner shading - 'vignetting' option. Picture effects can be attributed to the 'Fn1' function button, so again this is a one-touch process. While picture results may not match a dedicated DSLR, with this model Kodak is certainly heading in the right direction. With cheapie cameras having bitten the dust due to the smartphone/tablet onslaught, it makes perfect commercial sense on the face of it to see a compact system camera under the Kodak branding. The 16 megapixel Kodak Pixpro S-1 looks the part, largely acts the part, and is being offered to market at a very fair price. Yes it's yet another compact system camera in an already crowded market, and distribution at the time of writing remains limited to sales from its own website. But in the S-1 we have an interesting and affordable release all the same that hopefully points to an expanded future presence for the brand in the UK market.